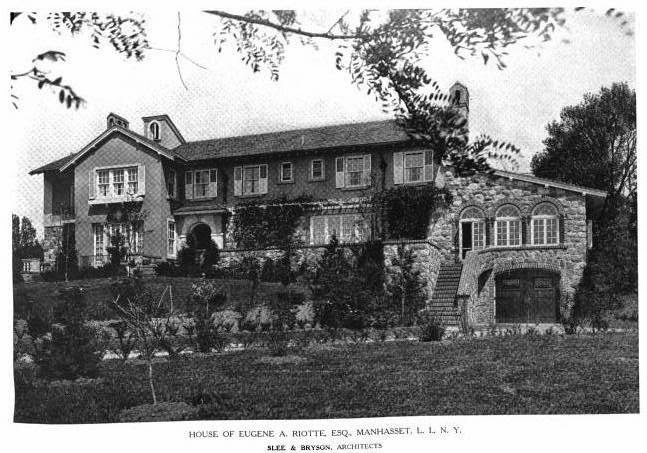 The Eugene A. Riotte estate designed by Slee & Bryson c. 1920 in Manhasset. Riotte was president of the Standard Motor Construction Company. The residence has since been enlarged, click HERE to see it on bing. Zach ~ Any date attached to the pictures ? Year of construction ? 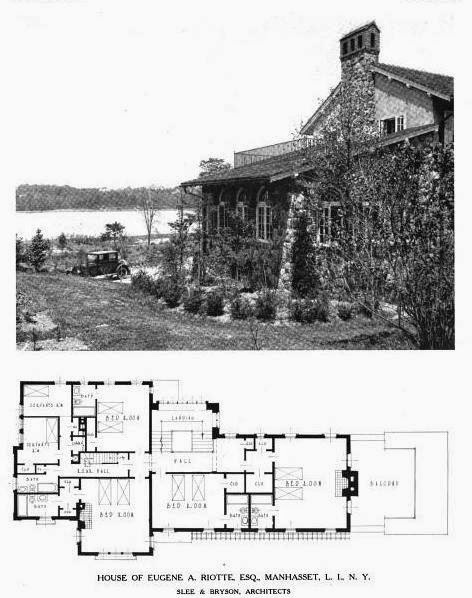 Well...I believe the house was built c. 1920 and these photos, as noted by the citation at the bottom, are from a 1922 publication. So I would say somewhere between 1920-1922. Sorry, Zach, I missed the citation; I was looking for one on the images themselves. 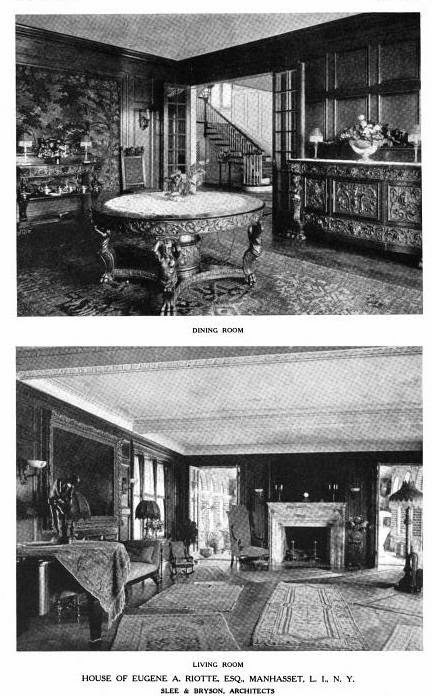 By the appearance of the furnishings of the dining room I would have thought the pictures were taken a score of years before the '20s; and talk about "scatter rugs" in the living room. Riotte, who died in Miami in 1929, does not appear on either the 1914 or 1927 maps. The 1914 map shows the name Southern Investing Co. over the general area where the house would be built and the '27 map shows a handful of names almost too small to read but none of them appear to be Riotte. 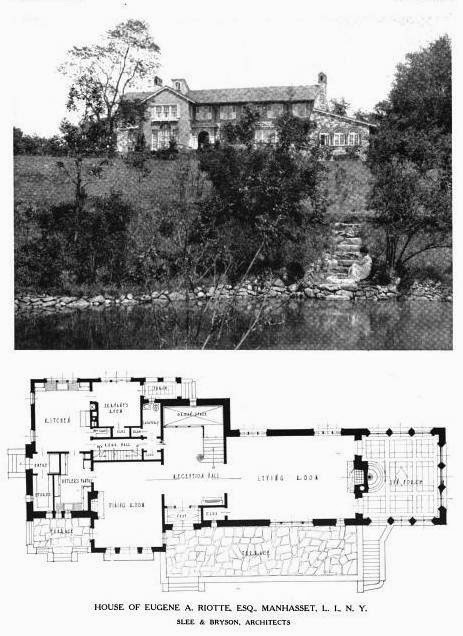 However, his 1929 death announcement states that Mrs. Riotte "is to bring the body north to their home in Manhasset, L.I." The 1939 map has no names. I believe this is the estate. Thanks Anon 11:57AM. I would not have called this house a "center hall Colonial" but I'm sure the Realtor knows of what they speak. Not pristine but not desecrated either. Appreciate the paneling has never been painted. The flooring in the hall is wrong & I can't figure out what the Hell is on the floor in the living room ... but it's wrong, too. The estate was actually torn down in September of 2015, a year later. Such a shame.